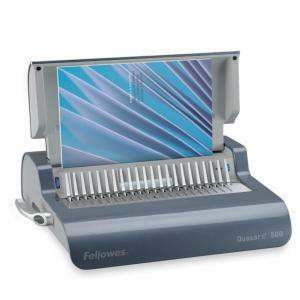 Electric comb binding machine is designed for moderate to heavy use. Punches up to 20 sheets at a time and binds up to 500 sheets with a 2" comb. Vertical document loading ensures accurate punch alignment. Built-in comb storage tray with document measurement device for quick setup. Adjustable rotary edge guide centers documents with ease. Binding machine includes binding starter pack.